This chapter provides recommendations for how you can advance the use of your region's regional ITS architecture in planning for operations. Figure 34 shows the three key leverage points that can be used to improve capability and efficiency in any area, including the use of an ITS architecture in transportation planning. 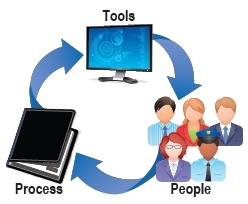 The three aspects that are shown are the major determinants of cost, schedule, and quality: the people involved, the technologies/tools that they use, and the processes and practices that are established. Your action plan should consider all three aspects so that your region can adopt a balanced approach that improves the skills of the people involved, arms those people with high quality tools (e.g., an improved, planning-supportive architecture), and adopts documented processes that help to ensure the capability improvements are sustainable in the long run. The following sections provide recommendations that employ all three leverage points: people, process, and tools. While this chapter is focused on measuring and improving capability in the specific area of architecture use in planning for operations, other resources are available for transportation agencies seeking broader process improvement guidance. For example, the AASHTO Systems Operations and Management Guidance at www.aashtosomguidance.org/ includes a set of evaluation tools and process improvement guidance covering all facets of transportation system operations and management. The Capability Maturity Model Integrated (CMMI) provides strong process improvement guidance for all aspects of project development and acquisition at www.sei.cmu.edu/cmmi/. Regional ITS architecture use will only gain traction if it has support from decisionmakers. The executive summary and Chapter 1 from this primer can be used to help make the case with MPO and State DOT decisionmakers that drive the transportation planning processes. In general, the case is best made by identifying the tangible benefits of regional ITS architecture use as described in Section 1.1. Regulatory requirements for architecture use in planning also provide motivation. See Appendix B for relevant requirements in 23 CFR 450 and 23 CFR 940. Once decisionmaker support has been established, it may be helpful to develop a regional policy regarding improved architecture use in planning for operations. This will help ensure continuity even as decisionmakers are replaced. Additionally, it is important to establish a collaborative forum to coordinate and lead the effort that includes stakeholders with a vested interest in planning for operations and the regional ITS architecture. This may be an ad hoc committee or a new item of business within an existing policy or technical committee. Once you have decisionmaker support, the next step is to perform an unbiased assessment of the region's capability to productively use the regional ITS architecture in planning. Figure 35 shows a basic capability maturity model that can be used to assess your region's capability in this area. The incremental capabilities reflect a natural progression from basic architecture updates to documented, productive use of the regional ITS architecture in planning. This model can also be used to plan and measure your region's improvements over time. As shown, a region's ability to use a regional ITS architecture in planning begins with the architecture itself. Does the architecture reflect input from planners, and does it include components that are ready for use in planning? Architecture use will not be productive until these criteria are met. Refer to Chapter 4 for a broad range of architecture improvements that are oriented towards making the architecture ready for use in transportation planning. 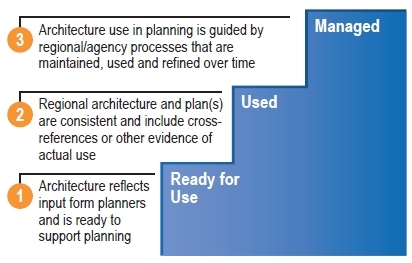 At the next capability level, the quality architecture is actually used in planning, as evidenced by consistency and interconnection of the architecture and related plan(s). The third level, "managed" architecture use and maintenance, is governed by regional or agency processes so that architecture use is better supported and more resilient to agency personnel changes. Table 6 includes self-assessment questions you can ask to measure your region's architecture use in planning. The assessment tool presented in Table 6 should be regarded as a starting point for assessing the degree to which the architecture is used. It is not a comprehensive tool covering all aspects of architecture use, but it will help clarify certain areas and identify opportunities for future improvement. Table 6: Self-Assessment for Use of Regional ITS Architecture in Planning for Operations. The architecture (and ITS strategic plan) includes a detailed description of how the architecture is incorporated and used in the metropolitan or statewide planning process. Planners from the MPO and/or State DOT were involved in developing/maintaining the architecture (and ITS strategic plan). The architecture (and ITS strategic plan) is used to identify an up-to-date sequence of ITS projects. The architecture (and ITS strategic plan) includes projects that directly support or implement M&O strategies in the plan. The architecture includes inventory elements that support data collection and performance monitoring that support planning. The architecture was updated to support the last update of the related metropolitan/statewide transportation plan. The metropolitan/statewide plan identifies M&O strategies that are defined in the architecture (or ITS strategic plan). The projects identified in the architecture (or ITS strategic plan) are integrated into the STIP/TIP. The metropolitan/statewide transportation plan contains language that refers to the ITS architecture and how it is linked to the plan. A regional stakeholder organization or committee has been identified to monitor and manage architecture use and maintenance. A documented policy is in place that supports use of the architecture in the planning process. Procedures that define the process that is used to develop the metropolitan/ statewide transportation plan cover architecture use. of the relevant portion of the regional ITS architecture. The transportation project prioritization process takes into consideration how proposed projects support the regional ITS architecture. Once you assess where your region stands in the above capability model, it is time to take small, incremental steps toward increased capability. It will take time to progress all the way up the highest capability level, but major benefits can be gained through making a few basic improvements. Below is a sorted list of actions that correspond to achieving greater capability in applying the architecture to planning for operations. Hold one or more meetings that bring together the regional ITS architecture developers with transportation planners in your region to discuss the function of the regional ITS architecture and its potential for use. Ask planners to identify any issues or challenges in planning for operations that may be better addressed by use of the architecture. For example, the need for data to support system monitoring and performance measurement could be addressed by defining data warehouse capabilities in the regional ITS architecture that would support data reporting and archiving. Determine if a regional planning for operations collaborative group exists in your region. If so, meet with the leaders and ask if the regional ITS architecture can be included within the scope of the group. If a group does not exist, form a multi-agency collaborative group that spans those involved with integrating operations into the region's planning process as well as regional ITS architecture developers/ participants. If you do not already have one, identify an architecture champion or champions for the region. Take advantage of training courses and workshops in regional ITS architecture use and maintenance and Turbo Architecture available through U.S. DOT including the National Highway Institute and the Consortium for ITS Training and Education. Visit http://www.its.dot.gov/arch or contact your FHWA Division Office for more information. If your regional ITS architecture is not ready for use, plan an update to incorporate some of the improvements described in Chapter 4. If desired, a "Quick-Start" workshop can be conducted for your region that assesses your current architecture, develops a "Concept of Use" that defines how your region will use the architecture in planning and project development, and develops an action plan for your architecture update. Contact your FHWA Division Office for more information. Align the regional ITS architecture with the region's goals and operations objectives. This is a step that will be implemented over time as needs and services in the architecture are updated to reflect the region's desired operations outcomes. Seek out information on operational needs from the region's transportation planning documents. The congestion management process, if one exists, could be a good source of information on transportation performance issues related to congestion. Integrate those needs into the needs identified in the regional ITS architecture. Identify M&O strategies in the region's plan(s) and work toward including service packages in the architecture that support the plan's strategies. Update the sequenced list of projects in the regional ITS architecture to reflect the latest STIP/TIP. Search the architecture for sources of data that could support monitoring system performance and any operations objectives in the region's transportation plan. Involving the region's planners, contact the agencies responsible for the data and discuss possibilities for use of data in operations planning. Work with operations project/program implementing agencies to define and develop ITS-based projects with the contextual information provided in the architecture. Update the STIP/TIP project application process to require project applications to identify how the project fits with the regional ITS architecture.